Fort Oscar, directly across the harbour from the Capitainerie headquarters for the Bucket, provided the perfect perch for watching the start of the first of three races planned over the next three days here at the St Barths Bucket. And by the crowd that turned out there, it was clear that the word had spread about the spectacle 35 superyachts would create on the water as they started their opening-day counter-clockwise circumnavigation of the island. In medium winds and flat seas, Gazelles and Elegantes (Class A and Class B, respectively) took to the long course of 25.2 nautical miles, while the Mademoiselles and Grandes Dames made the medium course of 20.9 nautical miles their pleasure. With four classes there could be only four winners, and today those were the 33m sloop Win Win, the 54.6 Vitters ketch Marie, the 27.7-metre Bequia and the 55.9 metre Perini Navi Rosehearty. Marie, which won her class and the coveted overall Bucket title last year, edged out long-time rival, the 44.6-metre Adela, in Gazelles by a minute and a half, even though Adela started 11 minutes ahead in the pursuit-style start. “We were closing on her quite quickly on the penultimate leg when we were both running with our chutes toward the last bottom mark,” said Peter Wilson, one of Marie’s trimmers, “but it wasn’t until the last beat and 10 minutes before the finish that we actually got by her. We were both trying to lay the finish, and we had to get past them, so we put our bow down and tried to sail through them. We were abeam of them for quite a while.” Wilson explained that a left-hand shift helped Marie finally take the day. “We were clear ahead at that point, but it all depended on whether we had to tack to the finish or not. Had things gone a slightly different way, Adela could have beaten us, so the boats are well-matched and well-rated." Rosehearty, winner in the nine-boat Grand Dames class, beat Zenji by about 13 minutes. Her tactician Paul Cayard said key to the crew’s success was practice, making no mistakes, and pushing the boat to its full potential. "Our goal was to keep this the way it always has been: an event by the industry for owners," said Bruce Brakenhoff of Perini Navi, which joined Royal Huisman, Vitters Shipyard and Rybovich as joint stewards of the Bucket Regattas (a summer edition is held in Newport, R.I.) when the former owners were ready to pass the torch. 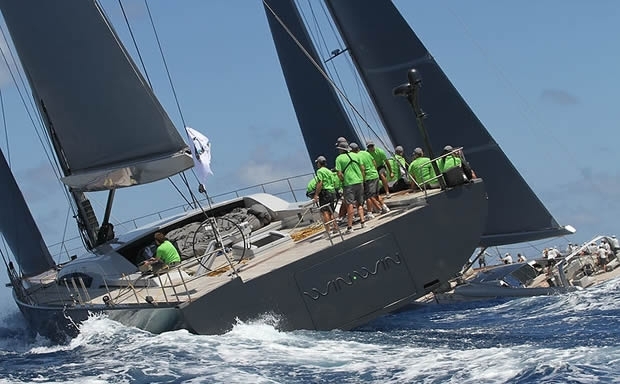 Sponsors of the St Barths Bucket Regatta are Alloy Yachts and Holland Jachtbouw. Supporting sponsors are Affinity Management Services, Burgess, Camper & Nicholsons, Doehle Yachts, Doyle Sailmakers, Dubois NA, Dykstra NA, Future Fibres, MTN, Newport Shipyard, North Sails, Pantaenius, Pendennis, Skuld Yacht, the Superyacht Report, Tradewind Aviation, US Trust, Willis, ZIS Insurance.